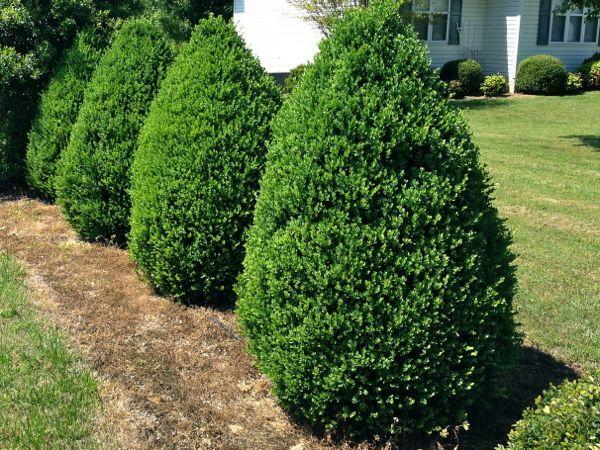 The Green Mountain Boxwood is a compact, mounded-rouded, densely branched shrub. The leaves are oval shaped and 1/3-1 inch long. In the winter the Green Mountain Boxwood has a lovely dark green color. This boxwood is a Sheridan hybrid that results from the crossing of Boxus microphylla and Boxus sempervirens resulting in the best characteristics from it's parents. Boxwoods are one of the most functional plants in garden history. You're sure to see them in most landscaping projects. We recommend planting the Green Mountain Boxwood about 5 feet apart and you'll get a nice border with space between plants. If you'd like you can plant them closer together and they will grow together. Currently shipping 5-10'' Ships in a pot.